My VitaMix is making me a lazy cook. When I have extra produce that I need to use up, do I scour the internet (aka “my favorite cookbook”) for a novel way to cook it? No, I just toss it into my turbo-charged blender and process it until it’s as creamy as, well, cream, as frothy as sea foam. I throw in a few herbs, a complementary spice or grating of pepper, and it’s cheating, really—gourmet cooking without the cooking. The crazy machine will even heat it up for me if I’m too lazy to get out a pot. So even though a few of you have written asking me to post more Vita-Mix recipes, I hesitate, first, because I know that not everyone has one of these blenders-on-steroids and, second, because it’d be just too easy to work my way through the vegetable kingdom, blending up everything from celeriac to potatoes to zucchini and filling this blog with nothing but Vita-Mix recipes. And you wouldn’t want that. But let’s say you did. We could start with the letter A and one of my favorite vegetables, asparagus. 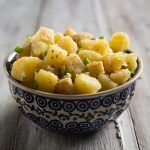 We could make it a bit special by roasting the asparagus along with garlic and onions to bring out their natural sweetness before blending with just enough raw cashews to add some extra body and creaminess. 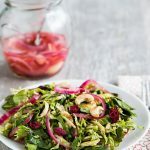 And we could preserve the fresh flavor of the asparagus by treating it simply, not overwhelming it with competing flavors, adding a sprinkle of lemon peel to brighten and highlight its earthy green taste. Don’t worry. I’m not going to let the Vita-Mix take over this blog, though with summer vegetables on their way, it’s certainly tempting. 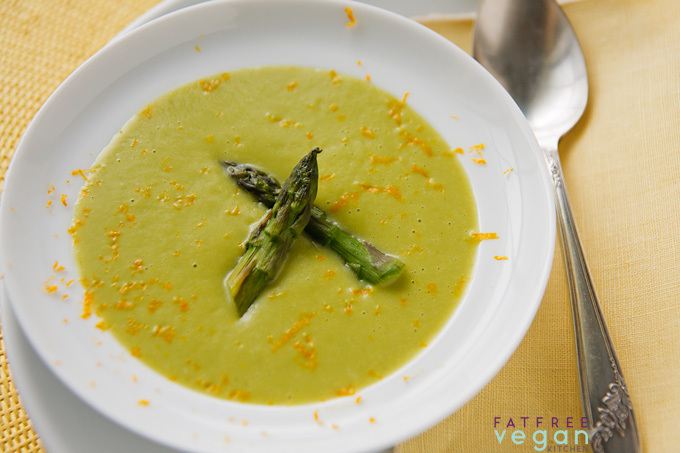 Actually, you don’t even need a high-powered blender to make this delicious vegan asparagus soup. Try it in any ordinary blender, and if it doesn’t get as smooth as silk, strain it through a fine sieve to remove any excess fiber. You don’t want a Vita-Mix anyway; it’ll just make you lazy. 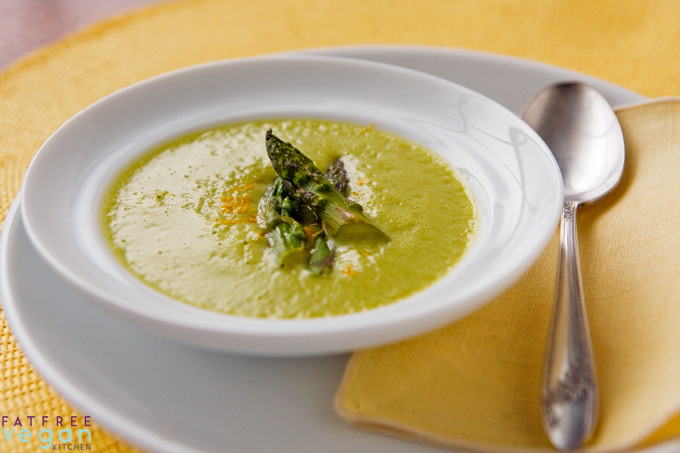 The fresh flavor of asparagus shines through in this simple, creamy soup. While the asparagus is roasting, blend 1/2 cup of the broth with the cashews and pepper until smooth. Leave it in the blender. When the asparagus is done, select several of the best-looking spears, remove the tops, and set aside to use as garnish. Cut the remaining asparagus into pieces and put it and the onion and garlic into the blender, along with the remaining broth. Cover the blender and blend on high until perfectly smooth. If you’re using a Vita-Mix, you can blend it on high for a few more minutes until piping hot (remove the center cup and cover with a kitchen towel to allow steam to escape). Otherwise, pour the soup into a saucepan and heat until hot, stirring frequently. Add salt, if needed, to taste. Pour into bowls and sprinkle with grated lemon or orange peel. Garnish each bowl with the reserved asparagus spears and serve hot. FatFree Vegan is a participant in the Amazon Services LLC Associates Program, an affiliate advertising program designed to provide a means for us to earn fees by linking to Amazon.com and affiliated sites. Can’t wait to try this recipe. I have one question though. Do your soups freeze well? I made this soup for supper tonight. I used my blender and the soup came out perfectly smooth. I did brush the asparagus with a little olive oil before roasting. It was excellent. I have a VitaMix and I absolutely love it!! It’s so powerful it is great for soups and shakes. Highly recommended. The cashew mixture stays in the blender and you add the asparagus, onion, garlic, and remaining broth to it and blend again. Sorry I didn’t make that clear. It sounds like your way got the same results. This sounds really good and I love asparagus so I must give this a try! Thanks! Wow! Omg is this ever sooooo good!!! 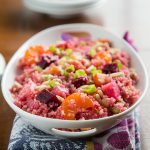 Great super easy recipe! Thanks so much! We thoroughly enjoyed this soup. That said, we are ETL so we each ate two servings and could have eaten more. I was surprised at how creamy the few tablespoons of raw cashew butter made this soup. I did cook it in the Vitamix and it didn’t get it too frothy, but did get it a bit overblended. I’m still trying to get the feel of using the Vitamix. Next time I think I’ll add a tiny splash of lemon juice for just a bit more tang. Thanks Susan for your wonderful recipes! Excellent recipe. I like how minimal the ingrediants and steps are. I used hemp seed butter and I roasted the asparagus in roasted garlic oil. Highly recommended. 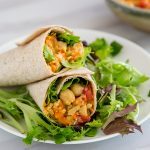 I’m bookmarking your site and I can’t wait to try out more of your fat free vegan recipes! Thank you. I made this tonight……my only addition was rice that I had in the bottom of each bowl that some chopped cilandro and lime juice and zest. It was soooooo good and the added rice made it very filling. Thanks again!!!!! I got the vitamix cheaper at Costco and I love it! It’s worth every penny!! I will be making this soup this week!! Thank you! Incredibly good. Going to top it with some croutons I made from leftover fennel-olive bread. I love my Vita-Mix, definitely going to try this recipe soon! After purchasing a variety of immersion blenders / blenders that all died cuz they couldn’t do what a Vitamix does, I succumbed and bought the Vitamix …worth every penny! It would have saved me $ to buy it first. I use it every day. I make a great protein shake every morning with 1 cup coffee, 12-15 almonds (in place of almond milk), chia seeds, flaxseed, choc whey protein powder, cinnamon, crushed red pepper flakes, cocoa, stevia and about 2 cups ice. OMG heaven. This site is the ONLY cookbook I ever use. Thank you for the endless “yum”. Funny, everyone is talking about the vita-mix. This SOUP is fantastic! The nuts really add some heft. It was delicious – will be making it again! Thank you for sharing. Ah! thank you so much. I overbought food thinking I was entertaining and I doubt ill get to my asparagus (they seem to get slimy pretty quickly). I will def be making this soup in the next couple of days!! I just made this soup and let me say this is soo delicious. I have owned a vitamix for quite some time and I havent made soups with it n boy have I been missing out. I look forward to other recipes to try out whether old or new. I just made your roasted asparagus soup and it is AMAZING! I don’t have a vitamix, just an old 80s blender, but I blended it for a good while and, although there are still some fibres in there, I actually like it like that! You can taste the goodness 🙂 Also, I ran out of stock, so I substituted half of it with miso soup and it tastes wonderful. I love how creamy the ground up cashews makes the soup. Thanks again. I made this tonight as a Welcome, Spring! soup. I can’t eat tree nuts so I subbed a head of cauliflower (roasted) and it was excellent! I have a 1500w “Ninja” (ie poor cook’s Vitamix) and it worked very well. Today my local store marketplace if anyone is in north Texas, had asparagus 98 c per pound. omg, I bought 6 pounds LOL Definitely going to make this soup again. I have a vitamix, I’m kinda scared of it LOL but I definitely appreciate getting good fatfree vegan recipes to use it with. It came with a recipe book but those tend to be smoothies or have fat. Would love to see more soups, dips, that use it posted here. Last time I made this soup I added some a little sweet potato I had in the fridge, and a touch of soy milk, and some raw cashews. We were too full to eat anything else after that! I was looking for a recipe to use up my asparagus stems from last night’s dinner. Soup! I am lactose intolerant, so this recipe is perfect. My first time using cashews in the Vitamix (totally worth the money!). I roasted a large baking pan full of asparagus stems, one whole shallot, some oil and garlic, for 14 min total. Added everything to the Vitamix with the broth, and voila, lunch! My 4 year old didn’t approve, but she devoured roasted asparagus and roasted onion for dinner last night, so only a matter of time until she will love the soup. Thanks for being my inspiration today!!! This soup is delicious and so easy to make. I added a dash of cayenne pepper to boost it. GREAT!! Looked in my fridge, huge package of asparagus that I have not gotten to you…thought … hmm asparagus soup…googled and found you. And guess what? I have a Vita Mix…and will be using YOUR recipe. A zillion thanks. Really excited! Made this for dinner tonight. I am down with the crud and didn’t want to have to work too hard. What a great recipe. It was easy, and VERY delicious. Thank you for the perfect soup on a cold, rainy evening in the Bay area. By the way…I made it exactly as you posted. I can’t even imagine it being more perfect. Excellent recipe. Your recipes are wonderful! Thanks for sharing. I am a personal trainer/nutrition coach in NYC and I wrote about asparagus today only to have one of my clients share your recipe on the entry. I’ve made this twice in the past week. Definitely my new favorite way to enjoy asparagus–which is good because my previous favorite way is smothered in olive oil. I stay true to the recipe except I add in a little nutritional yeast and I just use black pepper instead of white. I found perfectly lovely bargain asparagus in the clearance section of the grocery store tonight (2 pounds for a buck!!). 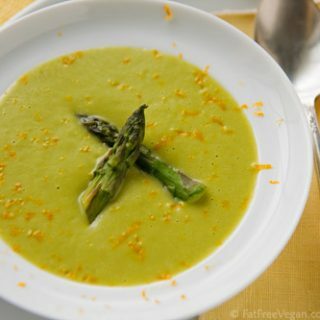 Googled vegan asparagus soup, this came up and I was thrilled to see it uses a Vitamix. I just got mine last month and LOVE it. This soup rocks. So easy, so delicious, and, at least for me, so cheap. My one tweak was to squeeze in some fresh lemon juice as I found the zest left a slight bitterness in the first bowl I ate. Highly recommend lemon juice instead — it brightened it up and brought more depth of flavor. I just made this and followed the recipe exactly. The roasted garlic added wonderful flavor without overpowering the beautiful asparagus. The sprinkle of grated lemon peel made it pop! I think I’m going to sprinkle everything with grated lemon peel now! Hi Susan, I recently indulged myself with a new Blendtec blender and have been on the search for awesome blender recipes. 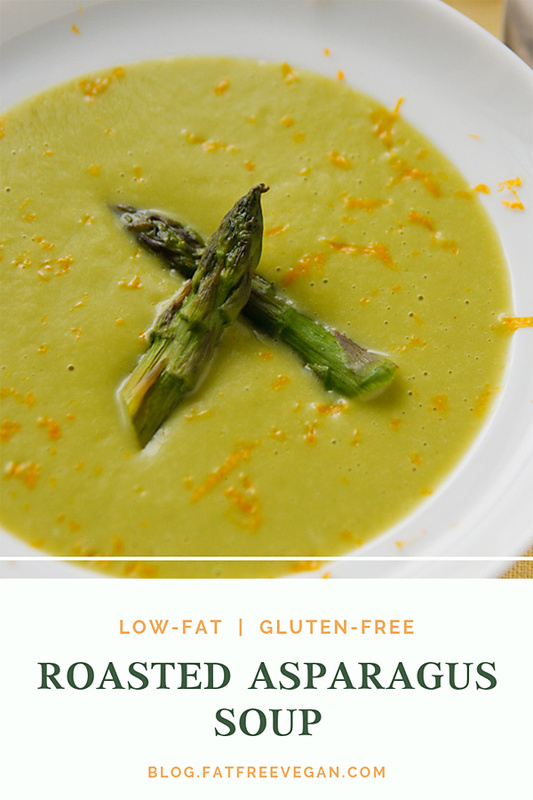 I made your Roasted Asparagus soup the other night and it was DIVINE! Can’t wait to try your other recipes!!! I know your recipe says this is 4 servings, but it was so good my husband and I finished it all in one sitting. Thanks for a great website!!! Here in Cyprus we can get field fresh veg virtually all year around…but…wild asparagus is for the harvesting at the moment…just done your roast asparagus soup recipe (substituted cashews for sunflower seeds)…it waaaaas gorgeous.!!!! This might be one of my ALL TIME favourite FFV recipes. I made a double batch, and can have 3 cups for lunch for like, 180 cals!! Looooooove it. Is there a vegetable broth that exists that doesn’t have added preservatives? How does one make vegetable broth? What vegetables are best? Could it be as simple as veggies water remove particles? Basically broth is just veggies simmered in water, like you say. It;s best to avoid broccoli and other cruciferous vegetables because they leave a strong flavor in the broth. If you do a search of this blog, you’,l find a garlic broth that I really like to use instead of vegetable broth. The cashews add creaminess but you can leave them out.